Three pedestrians and one cyclist have been killed in the city since Friday night. Two drivers fled the scene, and two were reportedly exonerated by NYPD. At approximately 11:30 p.m. Sunday, Mary Gater was on the sidewalk on Jamaica Avenue near Sutphin Boulevard when an 85-year-old motorist, eastbound on Jamaica, “lost control” of a Chrysler sedan, jumped the curb and struck her. Gater, 60, died at Jamaica Hospital. NYPD issued no charges or summonses, according to DNAinfo. At around 3:45 a.m. Sunday, 26-year-old Ken Baker, a Massachusetts native who lived in Binghamton, was hit by the driver of a Peterbuilt semi truck as he walked with his girlfriend on Sixth Avenue near 47th Street in Midtown. The driver, who was not hauling a trailer, was turning left from Sixth onto 47th. Baker was “sitting on the sidewalk, conscious and alert, with cuts on his arms and torso” when police arrived, according to the Worcester Telegram and Gazette, but was pronounced dead on arrival at Bellevue. The driver of the truck was unaware he had hit someone. He stopped after he was flagged down and remained on the scene. Police said no alcohol was involved, and no criminal charges or citations were issued. “It was just an unfortunate accident,” the police spokesman said. Robert von Gutfeld, 78, a research scientist at Columbia, said the intersection is dangerous. “When you’re crossing that intersection, you have the right of way and the drivers don’t look to see you crossing,” he said. Finally, Gothamist reports that an unidentified cyclist, believed to be the victim of a hit-and-run, was found with head trauma at Metropolitan Avenue and Stewart Avenue in Bushwick at approximately 5:15 this morning. The 26-year-old man died at Woodhull Medical Center. A second cyclist, a restaurant worker, was critically injured by a motorist at W. 104th Street near Central Park Saturday night. Nor is it an accident that since Hayley and Diego’s Law took effect, as officers ticket more drinking pedestrians than speeding drivers, NYPD continues to issue careless driving citations in only half of crashes that kill a pedestrian or cyclist. Even in cases where a motorist careens onto a curb and kills a person on a sidewalk, police declare “no criminality suspected” before enough time has elapsed to conduct an investigation. With the extremely rare exception, city district attorneys remain AWOL except in cases of DWI and hit-and-run. Meanwhile, legislation to stiffen penalties for hit-and-run motorists and prod NYPD to fully investigate traffic injuries and deaths continues to languish in Albany and at City Hall. There’s no excuse for a hit-and-run, but there is a big problem with the signal timing on this stretch of Broadway. A pedestrian has to hustle to get all the way across Broadway in one signal phase. And the green phase for Broadway traffic is also short, with the result that drivers get frustrated at the endless stop-and-go and gun it to try to beat the lights. I think “exculpated” (literally, absolve of blame) fits a little better than “exonerated” (since that would require that the driver had been blamed at first, which of course wasn’t the case). No matter, it’s appalling. The ongoing coverage by and pressure from this blog are exemplary. 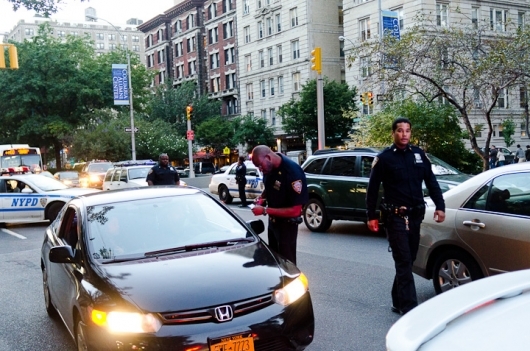 Every time the NYPD fails to cite a reckless driver, they’re selecting winners and losers. The driver who gets off scot free has just been handed a big win, but if you happen to be a pedestrian or cyclist…well hey, you’re a loser! He was talking about carriage horses which were grazed by passing buses or spooked into running wild. Meanwhile, you have four citizens of New York dead in one weekend. So where is our Public Advocate? Can he speak up for the public as much as he speaks up for horses? Arnold Slater was my upstairs neighbor and we were all shocked to learn of this death – not from NYPD but from the New York Post and NY1 who showed up on our doorstep Saturday. Did Police presume nobody knew him and he had no next of kin? According to our super, Mr. Slater had two or more cats who have been without food since Friday but legally, he’s not allowed to enter without the police. When people call the 6th Precinct, all we get is an answering machine. The ASPCA has been unresponsive as well. Media reports say NYPD is investigating but three days later and they’re nowhere to be found. De Blasio clearly uses the Daily News Style Guide definition of “public,” which is as follows: one (typically male) who drives a car in New York City as one’s exclusive mode of transportation, and feels aggrieved at having to circle one’s block to locate free curbside parking (sometimes, #%£@!, requiring a walk of more than a quarter block), occasionally pay a toll, or (worst of all), drive less than 15 miles an hour over the legal speed limit because Janette Sadist-Con rammed a bleeping bike lane down some community’s (not his community’s, mind you) throat by only meeting with the Community Board and other local stakeholders a half-dozen times before they voted unanimously to endorse it.